In a novel breakthrough researchers at University of Central Florida’s NanoScience Technology Center have developed a process to create flexible supercapacitors with more energy storage capacity and capability of recharging more than 30,000 times without the commencement of degradation. The technology indeed promises potential to revolutionize fields as varied as mobile phones and electric vehicles. 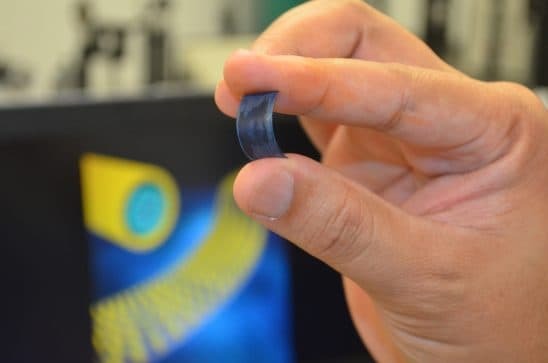 If the batteries could be replaced with these supercapacitors, one could easily charge a mobile phone in a matter of seconds without needing a re-charge for a week. The team of researchers experimented by applying newly discovered two-dimensional materials only a few atoms thick to supercapacitors. They developed a simple chemical synthesis approach to neatly integrate the existing materials with the two-dimensional materials as these held great promise for energy storage applications. The researchers developed supercapacitors composed of millions of nanometer-thick wires coated with shells of two-dimensional materials. A highly conductive core facilitated fast electron transfer for fast charging and discharging as the uniformly coated shells of two-dimensional materials yielded high energy and power densities. For small electronic devices, these materials are surpassing the conventional ones worldwide in terms of energy density, power density and cyclic stability. For instance, a lithium-ion battery can be recharged fewer than 1,500 times without significant failure. By comparison, the new process created by the researchers yields a supercapacitor that does not degrade even after it has been recharged 30,000 times. These supercapacitors are however still proof-of-concept not yet ready for commercialization, quoted the study published in journal ACS Nano.